Sing-a-long to the Sound of Music! 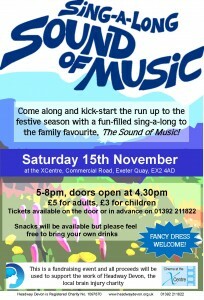 Come along and join in the fun at our first cinema event at the XCentre on Exeter Quay. 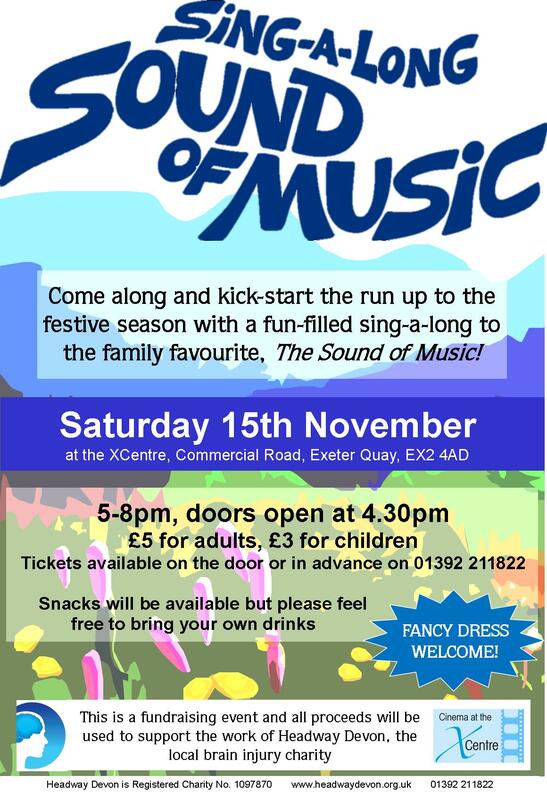 We will be kicking-off a year –long programme of film screenings with a sing-a-long version of the family classic, The Sound of Music on Saturday 15th November. Taking place in mid-November, this event is perfectly timed to help you get into the Christmas spirit with this festive favourite. So, if you and your family love nothing more than warbling along to a film musical or dressing up in a whimple, then this is the event for you. Fancy dress is welcome and there will be a prize for the best dressed! Tickets cost £5 for adults or £3 for children, or £15 for a family ticket (two adults and two children). Tickets are available on the door or in advance by calling Holly on 01392 211822 or emailing holly@headwaydevon.org.uk. Doors will open at 4.30pm for a 5pm start and popcorn, drinks and snacks will be available for a small donation. The XCentre can be found on Commercial Road, by Exeter Quay, at EX2 4AD. All proceeds from the event will be used to support Headway Devon’s vital work in the local community for people who have been left facing complex disabilities as a result of brain injury.